How to view the activities of your users in NetVizor. To view activities of a PC on your network simply select a Computer from the computer list by double-clicking or right-clicking on it. You will be given a menu that allows you to view the computer, synchronize settings, view the remote desktop in real-time, or restart the remote NetVizor client. If you click "View Computer" or double-click a computer, the NetVizor web interface will open for the remote PC. 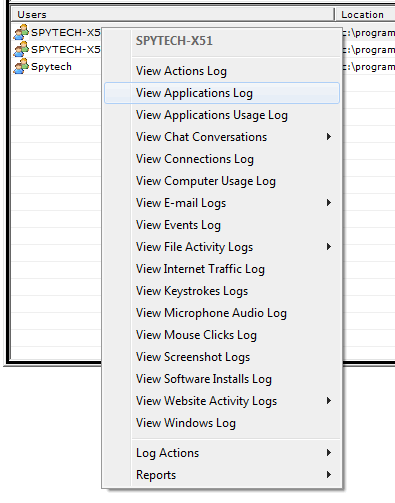 If you select a computer user from the Users list you will be presented with a list of logs you can view, as well as log actions and reporting features. If you have "Check if workstations are being monitored" enabled in the Viewer's viewing settings, you will see a blue computer icon next to a computer that is online and being monitored. A grayed out computer will indicate a PC that is not being monitored by NetVizor. If you think a computer is online, but is showing a grayed out computer icon, you can use the "Restart remote client" command to attempt to restart NetVizor on the remote computer. If you need to view log storage folders that are not listed in the viewer, view the Network Log Storage section. If you need to add a computer to the list that is not currently listed, view the Computer List Config section.